The midpoint of the line segment joining the foci is called the centre of the hyperbola. In the given diagram and is the center of the hyperbola. 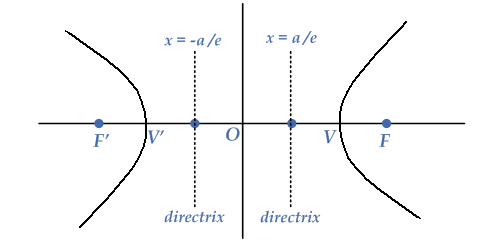 The line through the foci of the hyperbola is called the focal length axis or transverse axis. In the given diagram the X-axis is the focal axis of the hyperbola. The line through the center and perpendicular to the focal axis is called the conjugate axis of hyperbola, and in the given diagram the Y-axis is the conjugate axis of hyperbola. The points where the hyperbola meets its focal axis are called its vertices and are the vertices of the hyperbola. The two separate parts of a hyperbola are called its branches.